Safe standing: Will the 12th man finally have its say? The 1989 Hillsborough Disaster is an event that will long live in the thoughts of football fans across the globe. As a result of overcrowding in the two all-standing sections of the Liverpool supporters’ area at the 1989 FA Cup Semi Final, 96 fans were crushed and killed – with a further 766 suffering serious injuries – making it the deadliest disaster in English football history. The tragedy rocked the football world and had vast repercussions on the way fans enjoyed the game, mainly due to the Football Spectators Act (1989) being introduced shortly afterwards. The legislation required all clubs in the top two tiers of English football to be all-seating, and this law is still in place today. However, many fans argue that the Act only helps to increase the possibility of a similar disaster happening once again; people continue to stand at football games in order to create what they perceive to be a better atmosphere, and this persistent standing creates an even more dangerous environment for fans to watch the game in. Hence, the idea of rail seating (or safe standing as it is more commonly known as in the UK) was introduced, building metal bars at chest level between each row of fans, in an attempt to eliminate any possibility of fans falling from one row onto the next, while still allowing them to enjoy the atmosphere that comes with standing at a match. Multiple recognisable clubs around the world have already introduced safe standing in their respective stadiums, with the Bundesliga and the German government permitting its use across all German clubs. Its positive effects are clearly being seen in the incredible atmosphere created by the Westfalenstadion’s “gelbe Wand” (Yellow Wall), which was recently re-developed to become the world’s largest stand made up entirely of rail seating. Even closer to home, Celtic unveiled its own safe standing section at Celtic Park in July 2016, after the laws regarding safe standing in the Football Spectators Act were relaxed in Scotland, making them the first club in the UK to do so, and helping them to boast one of the most intimidating atmospheres in European football. 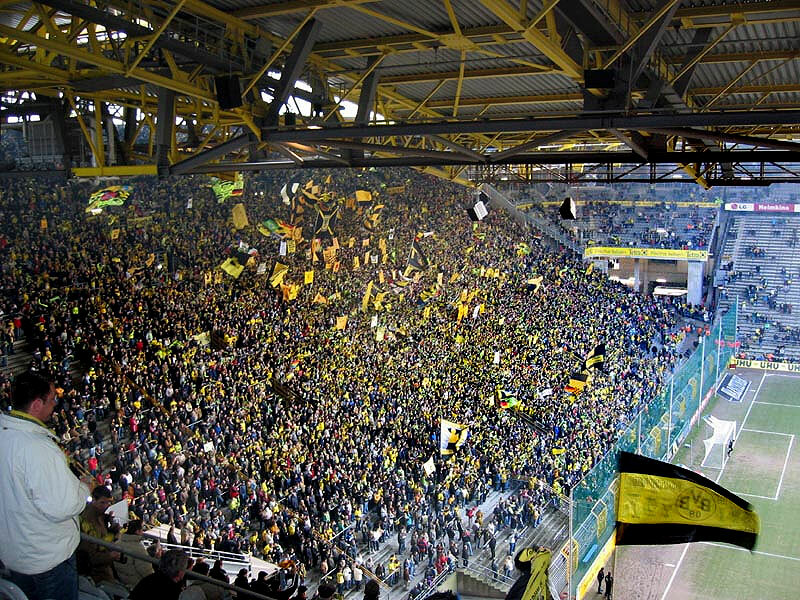 Not only would the introduction of safe standing in English grounds help to make this aspect of supporting “safer” for the fans, as the name suggests, but it would also help to recreate the atmospheres we find at Dortmund or Celtic in the English game, creating a more intimidating experience for opposing teams, and a more enjoyable one for supporters. Bringing all of this into consideration, why is it then that the UK government still appears to be against the introduction of safe standing into English stadia, particularly in the Premier League and Championship? After rejecting West Bromwich Albion’s appeal for safe standing to be introduced at the Hawthorns on 9 April, Sports Minister Tracey Crouch affirmed that the government currently have no plan to revoke the laws introduced with the Football Spectators Act, and that it was only a “vocal minority” of football fans that really wanted rail seating to be introduced. Nonetheless, perhaps this statement from such a powerful figure in the sporting world was the provocation that English football fans really needed to truly add some traction in their fight for safe standing to be introduced. Since the day of Crouch’s statement, a petition started by Bristol City fan Jon Darch asking for safe standing to be allowed in the top two divisions of English football has reached more than 100,000 signatures, meaning the matter will be considered for debate in Parliament, with multiple clubs such as Wolves, Crystal Palace, and Newcastle United backing his initiative. The Football Supporters Federation (FSF) has stepped up its “Stand Up For Choice” campaign, and the English Football League (EFL) themselves have launched a survey in partnership with the FSF, asking for fans’ opinions on safe standing being permitted for all English grounds. Having the support of a foundation as large as the EFL is a huge advantage for the FSF, with EFL Chief Executive Shaun Harvey saying that his organisation has “a mandate from the clubs, and if there is an equal mandate from the fans it would create a very powerful voice that should be heard.” For once it appears that the “vocal minority” of football fans are finally being allowed their say, and soon they may be able to stand up at games without the fear that an event similar to the one that resulted in the deaths of those 96 Liverpool fans will happen once again. I would encourage you to visit the petition by Jon Darch and the EFL survey, so that you too can support the fight for safe standing in English football.